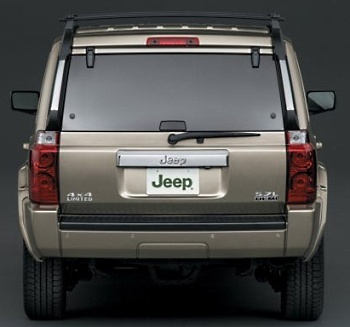 When the Jeep Commander was released in Fall 2005 as a brand new model, it was not devoid of controversy. The Commander’s retro boxy exterior styling, which was a modern rendition of the popular 1984-2001 Jeep (XJ) Cherokee’s exterior styling, was instantly loved by Jeep purists. On the other hand there were the detractors (mostly from the crossover SUV crowd) who did not like the styling. The styling was like the 1980-1985 Cadillac Seville in that you either loved it or hated it, there was no in-between. The same boxy Commander styling was later applied to the all-new 2008 Jeep Liberty which was a very successful release that has sold very well. So why is Jeep after the current 2010 model year pulling the plug on the Commander? The answer is that the Commander, which during its five year lifespan has sold in decent numbers, was never the sales success Jeep had anticipated. In fact during the times of very high gas prices and slow sales, Jeep had to offer very enticing incentives to move Commanders off dealer lots which most certainly cut into Jeep’s profit margins. When its competitors were on the receiving end of a massive increase in sales of full-size SUVs during the mid to late-1990s, Jeep should have realized it had a gaping hole in its product lineup. Jeep ignored the problem or may have hoped it would go away. A few years into the new millennium sales of full-size SUVs were continuing to skyrocket. It was then that Jeep finally decided it must get in on the action. The logical route was for Jeep to develop a full-size SUV on Dodge’s (full-size) Ram pickup truck platform, which would have given Jeep a vehicle as big as a (full-size) Cadillac Escalade. For whatever reason, that path was not taken. Instead Jeep decided to use the mid-size unibody (WK) Grand Cherokee platform as the basis for its new (XK) Commander which would be the first Jeep to have a third seating row (one feature that made the full-size SUVs very appealing to buyers). The problem then with using the WK platform was that the Commander was limited to being around the same size as the Grand Cherokee. The Commander is only a few inches bigger in length and width than the 2005-2010 (WK) Grand Cherokee – it has a length of 188.5 inches and a width of 75 inches verses the WK Grand Cherokee which has a length of 186.7 inches and a width of 73.3 inches. Both the Commander and WK Grand Cherokee share the same 109 inch wheelbase. So you can see where adding a third row of seats would be tight in the Commander. The end result is the first two rows of seats have ample room (which includes decent leg room) but the third row is cramped. While the third row is comfortable and adults can fit back there – think of it as Jeep’s version of the “knee buster” Airbus A320 standard coach seat – not the type of seating that anyone over 12 years old would want to spend a lot of time in. However the real handicap of the third row is the lack of rear cargo space behind it. For instance a family of seven on a trip will be hard pressed to fit their luggage in the small space behind the third seating row – it’s either going to go into an outside attached trailer or on top of the roof rack. If the third row is not needed, it fortunately folds flat to give you lots of cargo space. In the car business timing is everything, and the Commander would have probably been a big sensation if it was released back in 1998. Unfortunately by the 2006 model year with high gas prices, a crumbling U.S. economy, and the exploding popularity of crossover SUVs – Jeep did pick a bad time to launch the Commander. Even so, with all that the Commander offered and even with its traditional boxy SUV styling, it managed to sell well the first year and remain in production for five model years. For 2006 88,497 Commanders were sold, each year since sales have continued to drop – last year’s final sales tally was 12,655 units which is a meager 14% of the 2006 sales figure. These sales did come at a price for Jeep, since the Grand Cherokee (which traditionally had robust sales) dipped in sales due to some traditional Grand Cherokee buyers opting instead for the Commander. Jeep had expected the 7-seater Commander would lure customers away from the makers of other 7 and 8-seater SUVs, but it did not anticipate that its bread and butter Grand Cherokee would lose sales to the Commander. The Commander is now available in only two trim levels which are the upscale “Limited” and the base “Sport” (for 2010 the upscale Overland trim level has bit the dust). Both are available with 2-wheel or 4-wheel drive. For the Limited there are two available full-time 4-wheel drive systems: Quadra-Trac II and Quadra-Drive II – both of which have two speed transfer cases and are “Trail Rated”. The Quadra-Trac II system uses Jeep’s Brake Traction Control System (BTCS) to control traction to the wheels. While Quadra-Drive II uses a very sophisticated Electronic Limited Slip Differentials (ELSDs) that ensure maximum traction to all wheels in any driving condition. The Quadra-Drive II is one of the best 4-wheel drive systems on the market; it provides the ultimate rugged off-road capability Jeep customers expect while also providing ultra smooth functionality on paved roads. In other words the Quadra-Drive II equipped Limited rides like a 2-wheel drive luxury car on the smooth pavement but can handle with ease the worst a wild off-road trail can throw at it. Jeep most certainly deserves some credit on the Commander’s styling. The boxy styling was a bold move even during the time of the 2006 Commander’s release. Jeep since the 1993 Grand Cherokee had been making a gradual departure from traditional boxy styling. When the Cherokee ended production as the 2001 model year came to a close, most Jeep fans probably thought that was the end of the boxy four-door Jeep. The Commander certainly proved them wrong. And with the current Liberty (which looks like a smaller version of the Commander) and the current four-door Wrangler (produced since 2007), it signals Jeep’s future commitment to continue producing stylish boxy four-door SUVs. Though there are some detractors, the Commander’s styling is overall very attractive. It’s the type of vehicle the more you spend time with and examine its exterior lines – the more appealing it becomes. The Commander Limited’s chrome front grille and accents give the vehicle a very distinguished look. Also standard on the last year of the Commander Limited are chrome rear assist step handles and rivet style fender flares – both of which add to the Commander’s visual appeal. On the Limited 17-inch wheels are standard, however a set of tastefully done Casino Chrome-Clad 18-inch wheels are optional – all-terrain tires are standard with both wheel sizes. And in case these items don’t provide enough bling there is a “Chrome Edition” option package which includes chrome door entry guards, a chrome fuel filler door, and chrome tubular side steps. For 2010, Jeep has made it easy for the Commander Limited buyer when it comes to engine choices – you get the 5.7 liter Hemi V8 or you get nothing. Gone is last year’s 305 horsepower 4.7 liter SOHC V8 (which was standard on the 2009 Limited). The 5.7 Hemi produces 357 horsepower and 389 lb-ft of torque. How can that be a bad thing? With Chrysler’s Multi-Displacement System (MDS) and Variable Valve Timing (VVT) this ultra powerful motor is efficient for a 4,800-lb boxy full-time 4-wheel drive SUV – 19 highway mpg is the EPA figure. As a comparison a 2010 Jeep Wrangler (with part-time 4-wheel drive) equipped with the 202 horsepower V6 has the same highway mpg figure of 19. Who says you can’t have your cake and eat it too? The 5.7 Hemi comes standard with a silky smooth shifting 5-speed automatic transmission. For those who want the 3.0 liter CRD V6 turbo diesel engine option, that is available in only some overseas markets but not in the U.S. With the standard Hemi the heavy Commander Limited’s performance is good, 0-60 mph is reached in the high-7-second range. However this does not tell the entire story. When driving the Hemi powered Commander the power is always available, there are no dead spots in acceleration from start to redline. When passing on two lane roads the Commander comes to life with a burst of energy and when quick acceleration is needed to accelerate onto the highway there’s plenty of power on tap to get the job done with ease. In real life situations, the Commander has more than enough punch to get the job done well and the massive amounts of low-end torque make this vehicle pull effortlessly from stoplight to stoplight. And if heavy towing is needed the Commander Limited is up to the task – when the Class IV towing package is ordered the maximum towing capacity is an impressive 7,400 lbs. Braking and handling are also good for a tall and heavy SUV however the Commander does not feel as nimble and quick as the shorter and lighter 5.7 liter Hemi equipped 2010 Grand Cherokee Limited. The Commander may be in the same mid-size category as the Grand Cherokee, inside especially behind the driver’s wheel it feels much bigger (here’s where the Commander has a Hummer H2 like feel). The boxy shape, higher positioning of the dashboard, the flat upright Wrangler style windshield, and the high ceiling give the Commander a full-size SUV feel. The tall front windshield and side glass provide excellent visibility – just don’t look into the rear view mirror this is where the Commander disappoints – for not much can be seen among the obstacles of headrests (which unfortunately is norm among many new vehicles with rear headrests). However folding down the third row of seats does help and the big side mirrors do a great job of providing substantial rear visibility, in fact so-much-so they become your new best friend. The interior in general is very well appointed in some respects it’s more attractive than its WK Grand Cherokee brother. The 2008-2010 WK Grand Cherokee (Limited and Laredo) and 2006-2010 Grand Cherokee SRT8 borrow (or shall we say stole) the Commander’s attractive automatic shifter handle. The new 2011 Wrangler equipped with the automatic transmission is also the recipient of this fine looking handle. The Commander’s round AC/heating vents is a design also used on the 2007-2011 Wrangler. Unfortunately the 2010 Commander shares the same steering wheel with the 2010 Grand Cherokee, the 2006-2008 Commander’s round steering wheel was subjectively more attractive. Some trim pieces especially in the center dashboard and console and some items like the power window switches are shared with the Grand Cherokee. However there’s enough exclusively Commander trim pieces to not get this vehicle confused with the Grand Cherokee. The Limited trim level is the one that really looks the part. 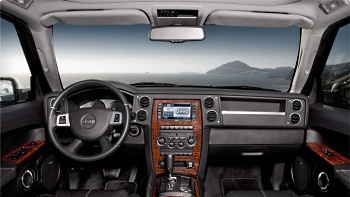 The wood and chrome trim of the Limited give the Commander an upscale look. And it’s hard to beat the round chrome inside door releases (much better looking than the ones found in the Grand Cherokee). The Commander Sport (doing without the upscale touches of the Limited is awash in a sea of plastic giving the interior too much of a utilitarian look). The Limited’s standard leather seating is both attractive and comfortable. A nice touch in the Commander Limited’s interior is the twin skylights above the second row of seats, which give the interior cabin an airy feeling. Commander Limited options like the media center/navigation radio head unit and rear DVD entertainment system are must haves for luxury oriented buyers. The 4-wheel drive Limited is generously equipped at a base price of $42,830. However checking off every single option on the list will bump the sticker price up to $48,065 (with destination charge included) which is a lot of clams even with today’s shrinking dollar but still reasonable when compared to the competition. Rest assured due to the Commander’s slow sales, being the end of the Commander production run, and with the popular new 2011 Grand Cherokee having arrived on Jeep dealer lots – if you can find a loaded Commander Limited still on the dealer lot expect to get a very nice discount. To most dealers the Commander right now is looked upon as stale bread that needs to be discarded to make room for the fresh delivery of 2011 Grand Cherokees which is a Commander buyer’s dream (hint: paying below invoice prices is to be expected). 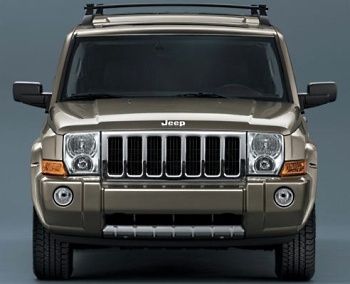 The Commander will be missed; it helped to define the rugged styling of the popular 2008-2011 Jeep Liberty. Though Jeep’s Commander gamble did not pay off for the long term, it still was a successful vehicle – after-all around 200,000 Commanders were produced over the last five years which is no small feat considering all the factors weighing against traditional SUVs like the Commander. However if the Commander had been released in 1998 it probably would have sold 200,000 units the first year. For Jeep the Commander was a fun ride down the wrong path, come to think about it that’s what trail riding is all about so maybe Jeep wasn’t too far off the mark.